10 overall Spanish Super Cup goals in 11 overall Spanish super cup appearances. 37 overall goals in 83 overall appearances for Argentina. Messi has spent his entire senior career in FC Barcelona and it has taken him 8 years to score 223 overall goals in 257 overall appearances for Barcelona while Ronaldo has scored 225 overall goals in 216 overall appearances for Real Madrid in 4 years. Ronaldo’s goal ratio of 1.09 is the highest of any player in the Spanish league all time top scorer list. if it has taken him 4 years to score 225 goals for Real Madrid and if he maintains or improves his current goal ratio, it is predicted that he will become real Madrid’s all time top scorer by 2015, that will be a shorter period to attain top scorer record for club compared to Messi that needed 8 years to attain top scorer status. Comparing both Ronaldo and Messi’s goal scoring record at national team level, Ronaldo has more goals with 43 in 106 appearances while Messi has 37 in 86 appearances. Ronaldo is older than Messi by two years and burst into the scene before him. That’s why Ronaldo has more career goals compared to Messi. It amazing how these two players in less than 10 years have achieved this feat. This is one good reason why they can be considered the greatest players ever and not Pele as most people claim. These two possess weaponry that makes it hard for defenders to contain. Now that the figures have been brought out, is there a clearly much better player? Like said earlier, most people would claim Messi because he has been more successful than Ronaldo in terms of awards and honours. Looking at the statistics shows Ronaldo has a better goal margin than Messi, in terms of overall career goals and goal ratio. Ronaldo scores at a better rate than Messi does, that’s why he has more goals than his appearances for Real Madrid. 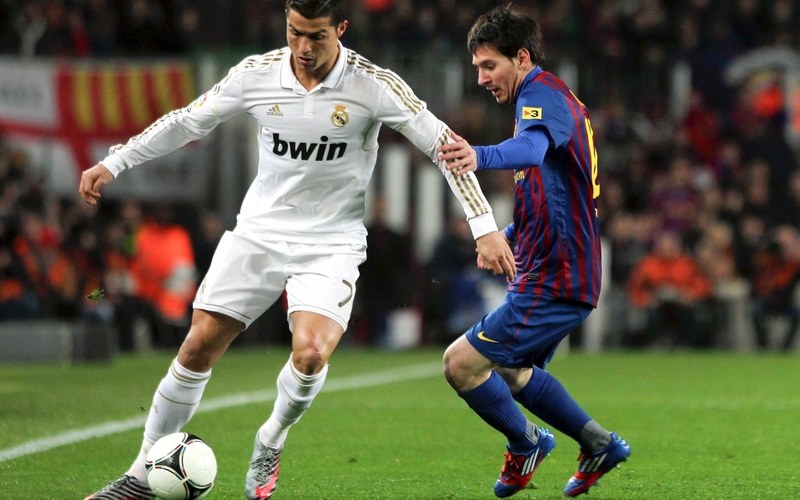 Messi has been breaking records faster than Ronaldo has but Ronaldo is not far behind. He is gradually clearing names of the legends and with his superb current goal ratio, he should be neck to neck with Messi soon. Do we have a clear great now? It’s still had to call with the facts established. If I were to take my pick, I’ll go for Messi for some reasons people can say I’m bias. Well true but you be the judge of that. Even if I pick Messi, I’m not using that to write off Cristiano Ronaldo’s brilliance. It’s had to establish the greatest player ever. Maybe when both Ronaldo and Messi retire from the game, there might be a clear great and then we can put the debate to bed but let’s not forget some young talents are emerging and who knows if in the nearest future they can be better than Messi or Ronaldo. In the mean time, the debate of both Messi and Ronaldo continues, they will continue to score a hatful of goals and defenders will wish Messi and Ronaldo never existed.